Last weekend, Sunway Putra Mall’s main atrium was filled with the excitement and laughter of kids as The Salvation Army arrived with the children for the book presentation of Sunway Putra Mall’s ‘Give the Gift of Reading’ campaign. 30 underprivileged kids, ranging from 4 to 19 years old, were chosen to represent the kids from the charity homes supported by The Salvation Army. This is a campaign to cultivate the love of reading among the younger generations and it is in collaboration with The Salvation Army, a Non-Profit Organization (NGO) that helps underprivileged communities by providing a wide range of community services that include residential homes for children and the elderly, a centre for special needs children, family support services, day cares, tuition centres and emergency relief services amongst others. The funds collection campaign spanned for over one month, and with the contribution from the public as well as book sales, Sunway Putra Mall managed to not only collect 1,300 books but also collected funds up to RM 10,000 through The Salvation Army’s Christmas Kettle Campaign. The funds will be used to support The Salvation Army’s centres and their work with underprivileged communities across Malaysia. 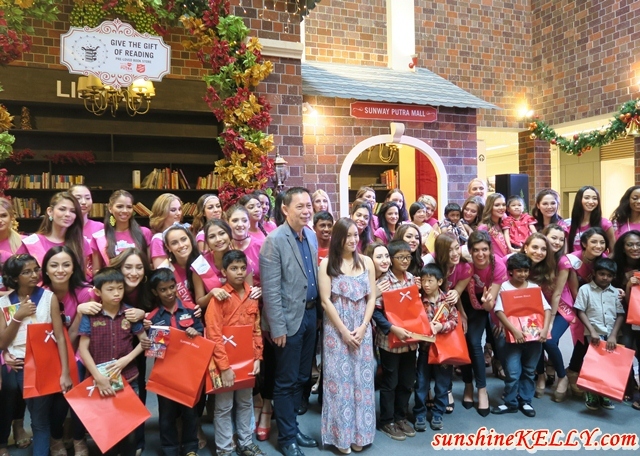 During the ceremony, Mr Chan, CEO of Sunway Malls and Theme Park was accompanied by 60 beauty pageants of Miss Tourism Queen of the Year International to present the books together with goodie bags to the 30 children. As part of their outreach program to spend time with the underprivileged community, Sunway Putra Mall was honoured to have the beauty pageants part of their CSR campaign. This was as a platform to educate and promote tourism and cultural exchange amongst the participating beauty queens. The day ended on a high note as they were treated to a fun time at the Parenthood Playland, which left the kids with huge smiles on their faces and a satisfied appetite as they each left with the gifts and a new memory that they can hold on to.